You’ve just released your album, and you’re putting it out into the world in style. A hometown release show followed by a short run of four shows. It’s a good way to break into new markets and expand your fanbase. But, as with any tour, you’re going to run into problems. Knowing how to deal with the inevitable, to make do with what you’re given, and still put on the best show possible is integral for any young band. You can start demanding separate monitor mixes and bowls full of green M&Ms when you’re more successful, but this is the "paying your dues" part of your career. And, as such, a few basic skills and some contingency planning will improve your chances for success. You played a raging hometown album release show to great aplomb. Everyone managed to shake off their hangovers and jump in the van to get to the next show. You travel six hours just to play, get caught in traffic, and arrive late to find out only 15 people showed up to the gig. And on top of that, the sound guy is a no-show. The promoter is breathing down your neck and doesn’t know how to work the soundboard. So now it’s all on you. Your band still needs to make sure the show goes off well. After all, 15 people paid $10 each to get in. That’s enough to get you at least to the next gig. If you’ve got your act together, at least one person in your entourage should know how to set up your band for live sound. There are hundreds of resources online to teach you how to do an adequate job. ProSoundWeb has a number of interesting articles. Even if it’s simply making sure the mics are plugged into the right channels and leveled properly with your instruments, this will go a long way towards making things run smoother. Have the promoter or bartender stand at the back of the room to make sure the levels are good and get the show on the road. If you do your job right and still manage to put on a killer show you’ll endear yourself to the promoter and you’ll be asked back. And really, when it comes to touring, getting a chance to come back is all that matters. If those 15 people each tell two others, your next visit has the potential to be a rousing success. You managed to make it through the no-sound-engineer show, collect your $150, and hit the road for the next gig. You arrive at the small bar only to find out that no one promoted the show and the local act has dropped off the bill. Head to the local copy shop and print of a couple dozen handbills, pass them out to the band members and start walking around the town. Hand out flyers to everyone you see who might looks like they’re into the music you make. If anyone is feeling a little demoralized from two shows in a row with unexpected unprofessionalism, well, get used to it. That’s touring. But you can also try and make a game out of the promotion. The last person to get rid of their handbills has to buy the first round of drinks. Or the one who gets the most people through the door gets to take the bed wherever you’re staying that night. Wrapping your head around the idea of last-minute promotion is a great tool to make sure people come out. At the very least you might get someone who will offer you a place to stay that night. This is a useful tool even if the promoter does their job. Getting the word out on the day of the show can never hurt. It’s a good idea to have some generic handbill graphics on a laptop in case of an emergency. You've just arrived in Montreal only to realize your bass player left his bass back in Toronto. How do you go about solving the problem? This is where good interpersonal skills will you help you get through the show. Find the bassist in one of the other bands and offer to buy her a drink in exchange for the use of her instrument for your set. While someone is buttering up the bassist, another member of your group should be calling the promoter from the previous show. They can be putting the bass on a Greyhound and sending it to your next stop. Learning how to talk to people, be polite, and help others out when the roles are reversed will go a long way in your career. Indeed, it’s a good idea in any job to work on your interpersonal skills. But send the talkers in the band out to glad-hand. If your drummer is notoriously grumpy, it’s probably a good idea to have him hang back and make sure no one steals your gear. All right, you’ve made it through four days of your five-day tour. You’ve managed to pull off every show, sell a few records, and ensure that the venture wasn’t a complete failure. You’re on the way to the last gig of the show and it happens: the crappy old van you bought off Craigslist for $200 finally breaks down. This exact moment has not only ruined tours, it’s destroyed bands. So before you call the tow truck or head to the mechanic, it’s good to have some idea of what the problem is. 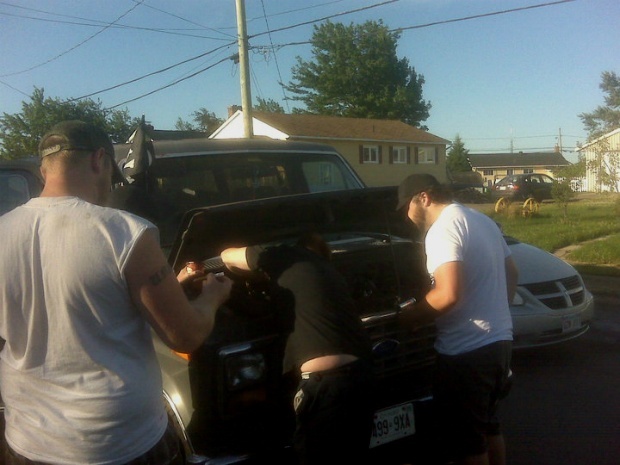 A basic understanding of auto mechanics is a useful tool for any touring band. Take a couple extra bucks out of the band fund at some point and pick up The Complete Idiot’s Guide to Auto Repair. If you can manage to do some roadside repairs to your old beater van, it can save you a lot of money in the long run, so getting a handle on how your vehicle works is integral. At the very least, everyone in the band should know how to change a tire. Do whatever it takes to put on a good show and make it to the next gig. Sometimes a band is only as good as the amount of gas they have in their tank. Making it to the show and blowing peoples’ minds is what this business-of-show is ultimately all about. Having a few extra life skills that are pertinent to your career will always help your chances of breaking through.